A number of intercity railways in Germany have been hit by simultaneous arson attacks, according to police. Investigators suspect involvement of far-left groups trying to disrupt the upcoming G20 summit. Cable duct fires ducts of rail signaling equipment affected intercity railways in several Germany’s federal states, including Berlin, Lower Saxony, North Rhine-Westphalia, and Saxony, federal police said in a statement. “According to the first evaluations, it might be a deliberate arson attack. The investigations into this [incident] and motives behind it are ongoing, a politically motivated crime cannot be ruled out,” the statement reads. In all, 12 cases of arson have been reported. 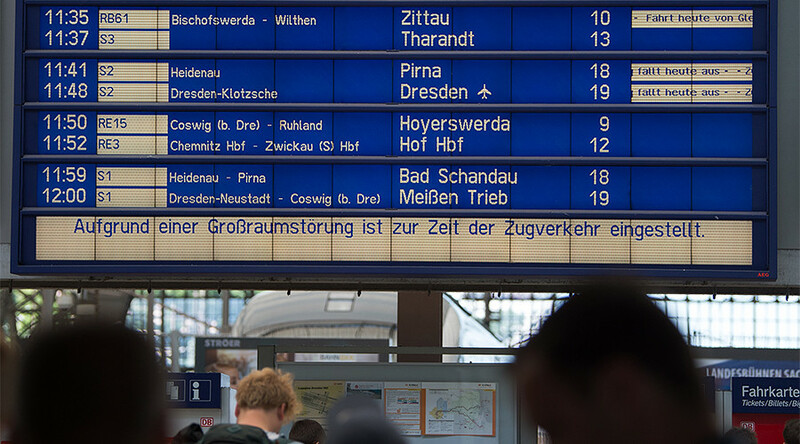 Railway connections in several locations – the eastern cities of Leipzig and Dresden, western cities of Cologne and Dortmund, as well as long range intercity lines between Berlin and Prague – has been disrupted, rail operator Deutsche Bahn said in a statement. Police have not detained any suspects yet. The arson attacks could have been carried out by extreme left-wing activists aimed at disrupting the upcoming G20 summit, which is scheduled to take place in Hamburg on July 7-8. Germany saw a similar sabotage incident on the railways back in 2011, believed to be carried out by left-wingers protesting the deployment of German troops to Afghanistan. Ahead of the G20 summit, Hamburg has experienced a series of arson attacks targeting cars of the police and the mayor’s security detail. Investigators have not ruled out a political motive behind the attacks.